STATE Cabinet met at New Norfolk this morning before reconvening with several government backbenchers for a "regional cabinet" meeting with the Derwent Valley Council. Six councillors and general manager Stephen Mackey held a brief meeting with the government representatives, during which Mayor Martyn Evans spoke about the opportunities for the Derwent Valley and the council's priorities. 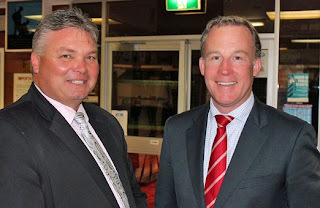 Premier Will Hodgman responded and then invited councillors to raise any concerns. Despite the wet and windy weather, it was decided to pair each councillor with a cabinet minister for site visits to areas of importance. With only limited time, these visits were restricted to the local area but included the New Norfolk Hospital, Willow Court, Frescati House, Derwent Valley Community House, the Esplanade, New Norfolk Rowing Club, Derwent Valley Railway and Glenora Rd. Between 1 and 2pm about 70 community, business and sporting leaders joined the government members and councillors for further discussions over lunch at the New Norfolk RSL Club with catering by the Magra CWA.